...actually not true, I get by with A LOT of help from Shari! Been busy...teaching the last class of 2007 at the store (wow), debuting new Hero Arts catalog and stamps, so until such time as I can catch up with photos and such, I rely on a little help from my friends. We had some awesome Customer Inspirations the past few days, I am sharing this one from Gerri. Check out this clipboard that she made. 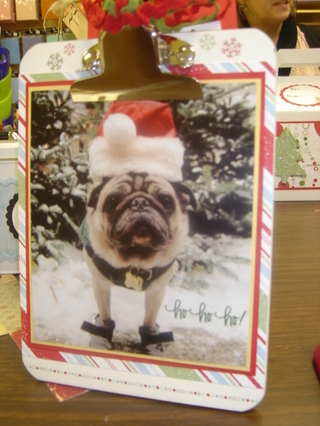 That cutest photo of the pug is one that she lifted from a calendar, all of the supplies to decorate and ebellishment it are from Scraptasia, of course ;) The "ho, ho, ho" and other rubons (yes, that is a rubon she rubbed on to the photo) is from CThru, along with the patterned paper. The cute little white clipboard is by Melissa Frances. She is giving this as a gift for Christmas. I agree with Gerri, if the recipient does not gasp with excitement, gush on and on with "did you make this, you are amazing"...take it back! Be an Indian Giver! Keep it! 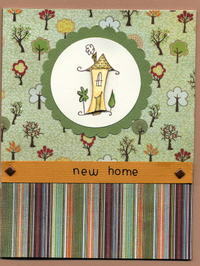 Or give it to your fravorite scrapbook store owner who is a dog lover herself. Sue stopped in @ Scraptasia on Friday after a long, long absence. Too long, and we know how that usually turns out right? Buying lots! yea! Even better than that, she went home and started creating with her new things right out of the bag! She's posted all of her Scraptasia creations on her blog, including some fun fun correspondence cards (a/k/a a "brief note"), so check it out! Just try pronouncing her last name ;) muchas gracias Sue! Anne Ghizzone brought in this delightful, inspiring, and o so sparkly project to show me why she buys bottle after bottle of Stickles from Scraptasia! 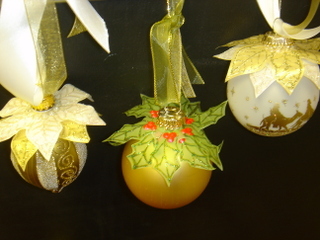 These ornaments are absolutely beautiful, and I am impressed with all of the handmade detail she puts into each one! Anne starts with sparkly ornaments she picks up at craft or department stores, and dresses them up with classic Christmas stamps from Outlines Rubber Stamp Company. The images are stamped onto vellum, trimmed out by hand, and then outlined with Stickles. Enjoy this Holiday Sparkle, there are more pics for you to view in the "Customer Inspiration" photo album. 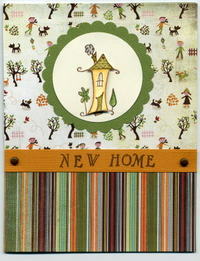 Scraptasia...come, be inspired, it's been the store's tagline since we opened 3 years ago. As much as I would love to take credit for everything, ideas are all abound and we inspire each other. So I am adding to my categories, and a new little photo album on the left side "Customer Inspirations". First up, Gerri's card. She sent this show and tell to me last week and it inspired me to create this new feature on my blog. 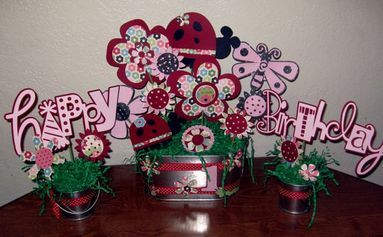 Next up is Shari's fun fun fun creation for her granddaughter's first birthday party. Yes, she MADE this. I understand the Circut was involved...the paper is from SEI.